Aldo Ciaccini is a young Audio Engineer who was born in Rome, Italy in the year 1992. He began close with the world of audio at the age of 16 years, by attending music recordings and producing music. 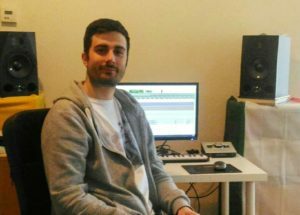 In September 2014, Aldo Ciaccini decided to transform his passion for audio into a concrete opportunity, so he moved to Amsterdam in order to attend SAE Institute, where he obtained a diploma in Audio Engineering and a Bachelor in Audio Production. During these last two years, Aldo Ciaccini has also gained some experience in different fields of the audio industry, by doing mixing and mastering services, and working as a live engineer in music clubs. In 2016 Aldo Ciaccini started to work for the first time in the post-production field by joining the EMS Films Company, as an intern audio engineer. Schrijf je hier in voor onze nieuwsbrief, en wij houden je op de hoogte van ontwikkelingen en acties rondom het project.